Jack knows every wrestling move ever, and all his dreams come true the day he’s recruited as a training assistant to Waldo’s Wrestling Trolls. 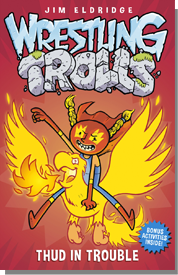 But little does Jack know he’s actually part troll, and when his new family is in trouble he morphs into the terrifying Thud! With Milo, Big Rock and Robin the grumpy talking horse, the friends find themselves rescuing princesses that don’t need rescuing, breaking out of dungeon prisons and taking on Wrestling Orcs in a battle for the tournament prize money. Nothing ever goes smoothly for Jack and his friends though, especially after Milo is kidnapped by evil goblins determined to get their greedy hands on Big Rock’s winnings! 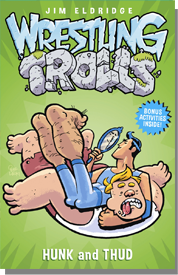 With even more smack-downs, tie-clinches and backwards pinfalls, the second instalment of the WRESTLING TROLLS series has hunky wrestlers with hairy feet, a horde of vile villains and a little boy with a BIG personality. Waldo’s Wrestling Trolls are back, and they’re ready to rumble! But the villainous Lord Veto has other plans. Challenged to a Giant Rumble but suffering from a shortfall of wrestlers, Jack and his friends set out to find more participants for their great battle. But what starts as a fun-filled road trip in their trusty caravan soon becomes an action-packed adventure filled with dangers such as farting Billy Goats, poisonous spiders and evil servants of the wicked King Nugget. 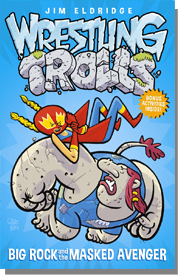 With their new taco-eating, super-bendy and even transfigurative friends at hand, will the Wrestling Trolls make it back alive – or better yet, to the match? 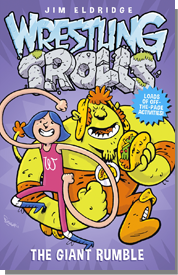 This WRESTLING TROLLS story was created on The Story Adventure, where week by week Jim wrote a new chapter using ideas from school children – characters, locations and plot twists. See if you can spot them! In the second story, villainous Lord Veto tries to break up the Waldo’s Wrestling Trolls family. He plants seeds of doubt in Jack, which sets Milo off, and soon Princess Ava is caught in the middle of two very grumpy boys – when they have a wrestling tournament to fight! After leaving school at the age of sixteen, Jim worked in a variety of jobs, including a stoker at a blast furnace, on a production line and as a transport manager before going to teacher training college. Jim taught in a variety of schools, both primary and secondary, working particularly with children with reading difficulties. Jim is now an award-winning writer, with over 250 TV, and 250 BBC Radio 4 scripts to his name. He has had 79 books published which have sold over 3 million copies. His television works including THE GHOST HUNTER, JULIA JEKYLL AND HARRIET HYDE and the Sci-Fi series POWERS amongst many others. His radio work includes the long running BBC Radio 4 series KING STREET JUNIOR and the comedy classic PARSLEY SIDINGS. Jim is particularly concerned with the rising rate of illiteracy, particularly amongst boys. Follow Jim at: www.jimeldridge.com. Jan Bielecki is an illustrator living in London. 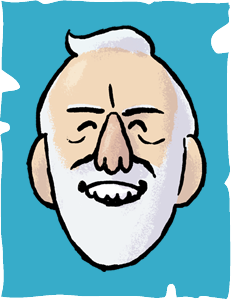 He has published two graphic novels and illustrated books for UK and Swedish publishers. “Drift” was nominated for Best Graphic Novel by the Swedish Comics Association in 2007. He really drinks a lot of coffee.